NOW is the time to take your training to the next level with a robot to train future industry employees. 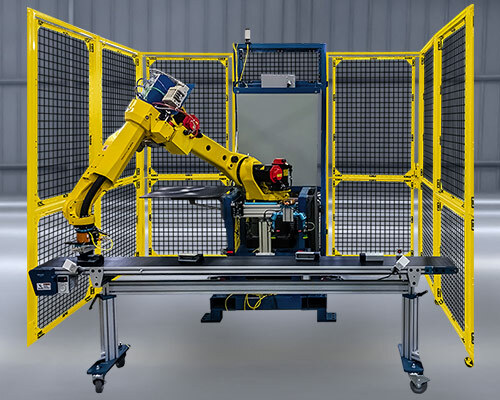 The AM-CERT Cell utilizes a FANUC M10 or M20 robot with communication to a PLC, multiple End of Arm Tooling options, custom folding fencing, and safety training features built into one system that is also portable using a pallet jack or fork lift. To accommodate the limited space in education environments, this cell is designed to expand to a 10’ x 10’ work cell giving ample area for conveyors, palletizing, or pick and place, and when you’re done just fold up the guarding to have a cell that is now only 54” wide by 72” deep. 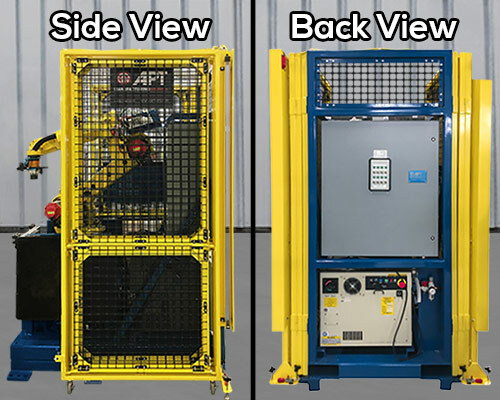 The APT AM-CERT is a full featured large robot cell using the full-sized Fanuc R30iB robot controller platform, fully integrated to Rockwell Automation CompactLogix PLC using Studio 5000 based programming and a Rockwell PanelView Plus 10” interface touch screen. This cell can teach PLC programming and advanced robot material handling in one self-contained, portable cell. 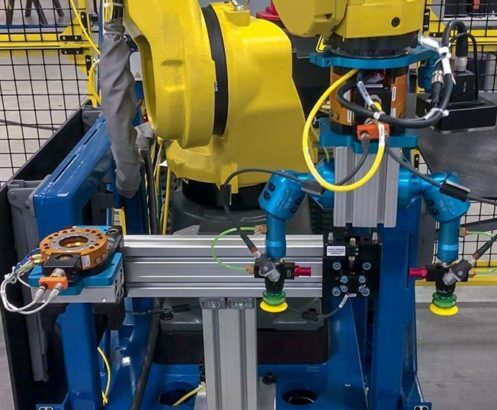 Advanced safety can be taught by use of safety interlock switches and light curtain or area scanner fully integrated into the robot and PLC safety circuit. 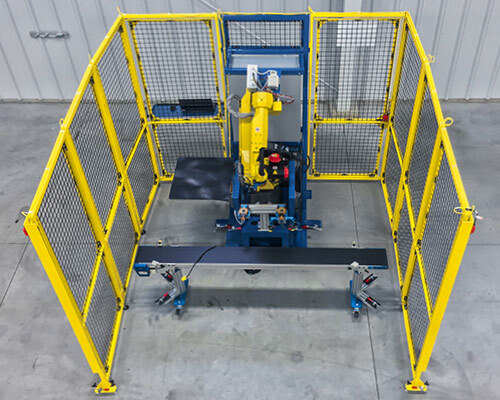 The cell is ready for the optional conveyor to supply parts to the robot or away from the robot to outside the safety fencing. Students will have a hands-on experience with standard industrial components they are most likely to see in real manufacturing environments. Learn robot program calls from a PLC based on decisions. Test I/O, motor operation, safety inputs, and vision guided robotics.